UAE-based Diamond Developers has awarded a key contract to Danish architect and design practice Cebra for designing a hi-tech school inside 'The Sustainable City', its first residential community in Dubai. The project aims at rethinking teaching and learning environments in a sustainable way. The school offers a modern alternative to the often very dense and air-conditioned school buildings that one often experiences in hot climates, said the top architect. The school has been designed in such a manner that students pass directly from the classrooms and out into open learning landscapes with greenery, wind towers and shaded outdoor spaces that ensure a pleasant climate for all students and teachers, where students stay and learn as much outside as inside. "We had to rethink the school in our design. 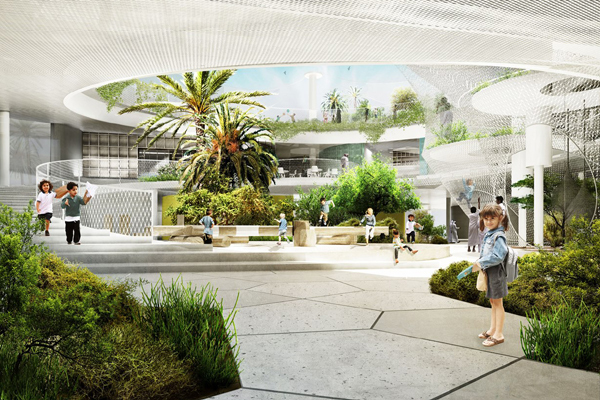 Why not take advantage of the warm climate, move many of the functions of the school away from artificial air-conditioned rooms, and out in a naturally ventilated, cooled environment?” remarked Mikkel Hallundbæk Schlesinger, the architect and head of Cebra (Abu Dhabi branch). "Cebra has worked extensively with learning architecture since we established the office in 2001, but this is the first time we design a school, in which the climate and vegetation constitute active design parameters," he stated. "At ground level, the school opens towards its surroundings, The Sustainable City. The green vegetation of the city continues into the school and up the facades. In addition, the students actively contribute to the green landscape by growing their own gardens with vegetables and flowers," added Schlesinger. “The designers at Cebra and SLA (landscape architect) have managed to create a wonderful combination of function and green space, which we believe will provide a pleasant and stimulating learning environment for a future generation,” he added. The school is to be an integrated part of The Sustainable City, which consists of townhouses and courtyard villas inspired by the urban fabric and heritage of Dubai’s old ‘Bastakyia’ district, a sustainable hotel and resort and an innovation centre. The Sustainable City offers the three pillars of sustainability: Environmental, Economic and Social, across one all-inclusive and comprehensive community landscape. The first net zero energy city in Dubai, The Sustainable City is being modelled with the support and direct supervision of the Dubai government to become an international showcase for high quality sustainable living. Providing a full array of luxury facilities and amenities that have no negative impact on the environment, The Sustainable City is a unique concept that redefines sustainable living through its energy-efficient housing, no service or maintenance fees, green education and healthcare, eco-attractions and a full range of indoor and outdoor leisure activities.